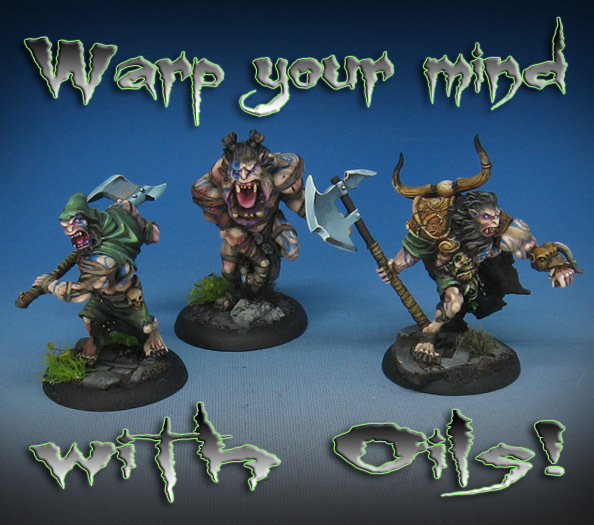 Warp Your Mind with Oils! We are on our way to Reapercon! Or, by the time this is posted, we might be there already. Once Fort Wappel is all set up, I look forward to doing hours of painting demos, and one medium I want to show off is oils! They have proven to be so useful, especially when working on large amounts of figures all at once. I am hoping to be able to demonstrate how you can still blend the paint on the surface of the figure, even hours after it has been first applied. I will also show how to glaze over wet oils... yeah, you heard that right! It was something that I have tried to show during the last few videos for the Patreon Page. While it sounds crazy, it does not work all that differently than if you were glazing acrylics. However, you have a much easier time feathering out the edges of the glazes. Also, this will work just fine over dry oil paint as well. In effect, you can "buff out" the edges of a glaze or a set of new brush strokes over the dry oil paint. So be sure to head on over to Fort Wappel while you are there and paint along with us! Some of the latest painting videos are on the Patreon page, available at the $5, $10 and $15 levels! We return to the desperate struggle to capture or recover lost German tank crews, the downed Soviet pilot and the German officer. Losing their transport so early had cost the Waffen SS dearly, allowing the sniper to pick off their light machine guns and keep them pinned. Only the SDKfZ 232 continued the fight on this side of the field, as the Pioneer unit had to support the right flank, as a dust trail was spotted by the commander from the area where the Zis gun had been. 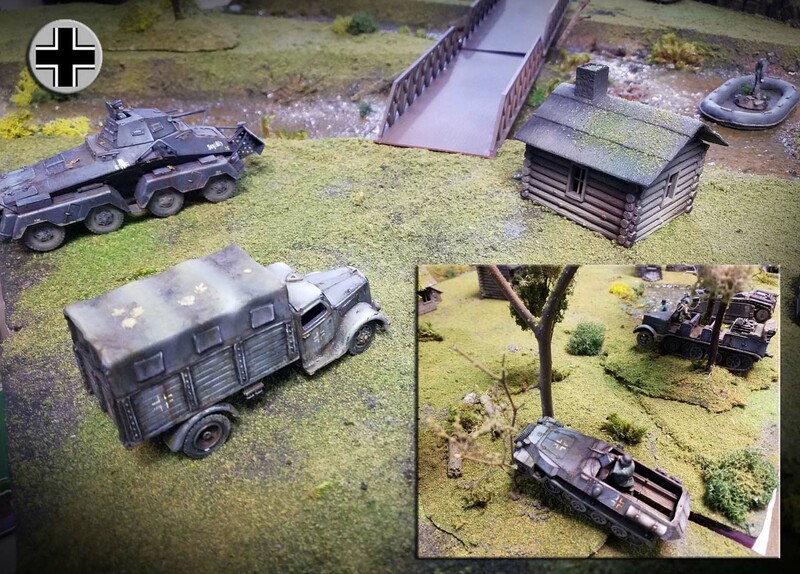 Suddenly the Siberian Veterans appeared, using that captured Opel Blitz from the previous battle. It was now that one of the German surprises rumbled out of the shadows, kicking up a dust cloud of its own! 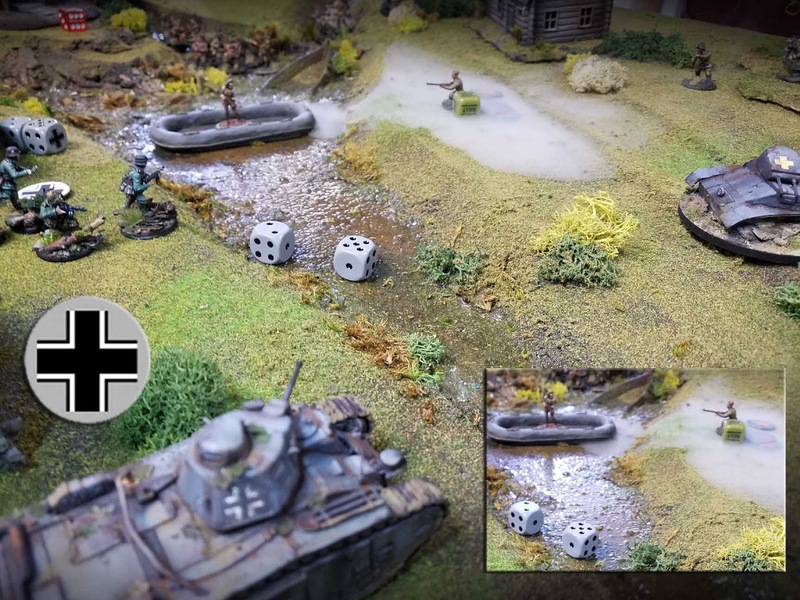 Using the Rad 8 as cover, the Waffen SS saw the officer in the river, who was directing them to head towards the wrecked Panzer and its crew. He would sacrifice himself to save his tank crews, who had taken on the dangerous mission of capturing the Soviet pilot at his request. Now the second surprise made its presence felt as the Pioneerwagen fired a direct shot from the squeeze bore howitzer. It blasted a Ghaz truck to pieces, much to the shock of the Soviets who thought they were relatively safe on this part of the battlefield. 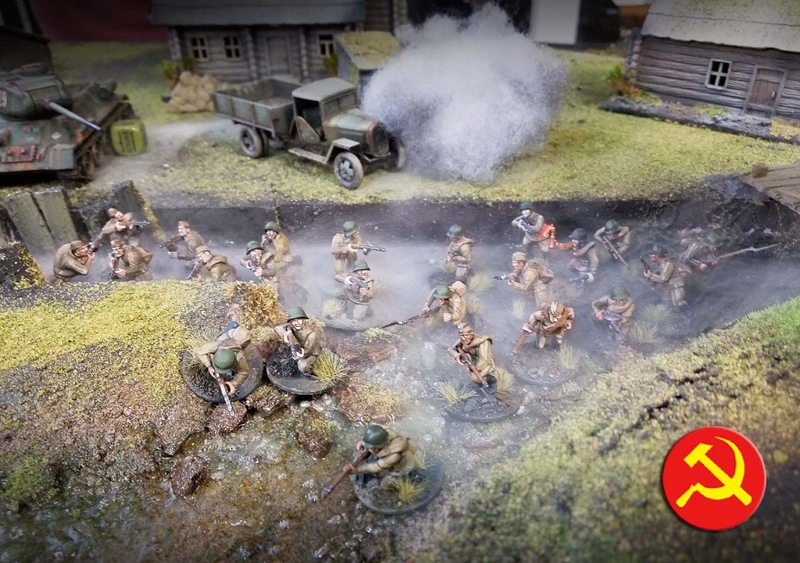 However, the smoke of the blast seemed to create even more cover for the waiting Soviet infantry, now getting even closer to capturing the German officer. It was not long after the smoke settled from this scene of destruction that the Panzerbusche scored a hit on the T-34! While it did not take it out, it did cause the crew enough strife to make them spend several minutes to catch their senses again. 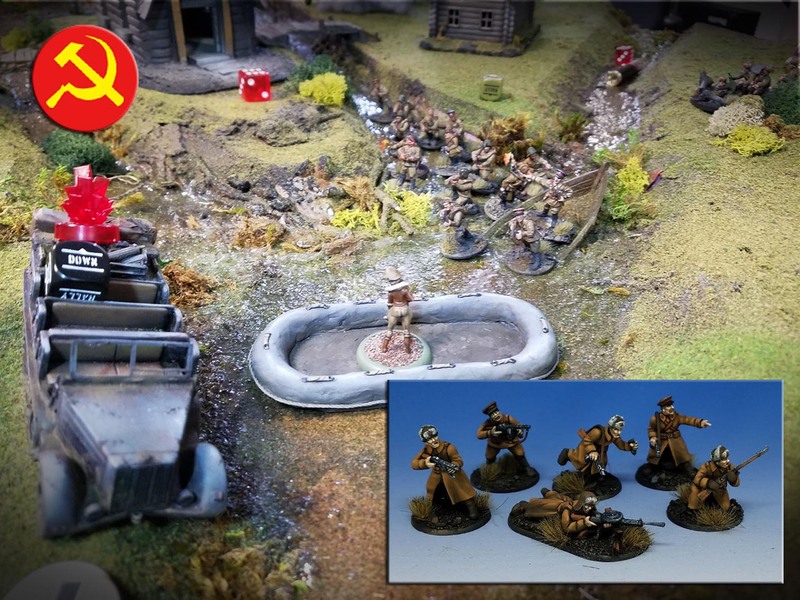 The Pioneer unit began its move forward, hoping to counter the 3 Soviet units. 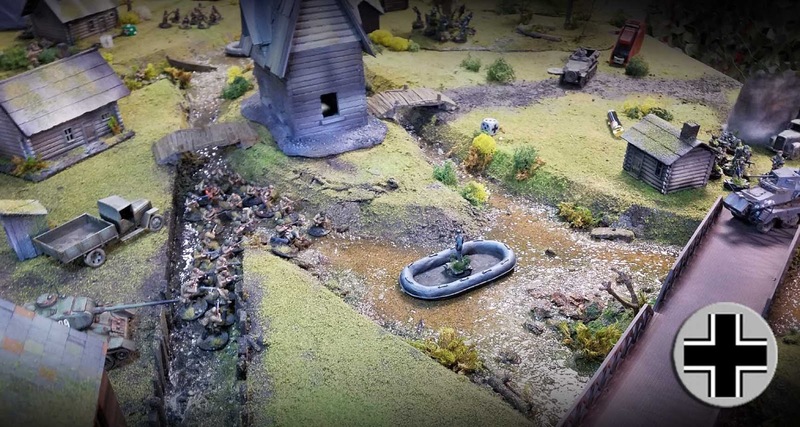 This would be problematic, since the mortar was not able to take down the machine gun crews across the river. Any crossing attempt would be near suicide. However, the Pioneers were able to utililze their tremendous close range firepower to decimate the raw Soviet recruits! 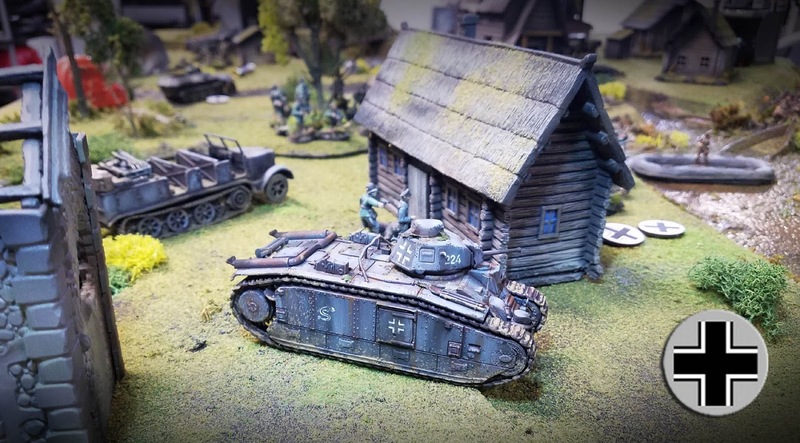 The last man standing was then taken down by the coaxial machine gun of the Flammpanzer. Not even Royanovich could save them. At the same time, the Beast of the East fired a gout of flame at the Opel Blitz, which had now been revealed to be employed by the Siberian Veterans. The petrol immediately caught fire, and it promptly exploded. 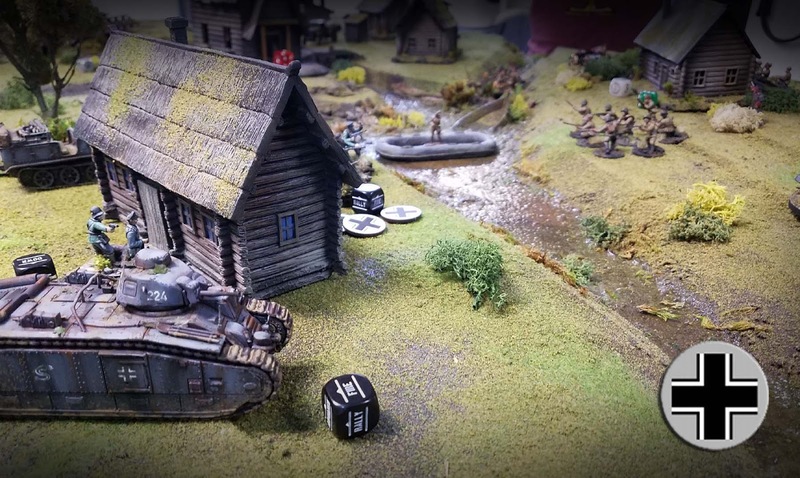 The celebration did not last very long, as the T-34 crew regained their morale and destroyed the Rad 8 on the other side of the river. 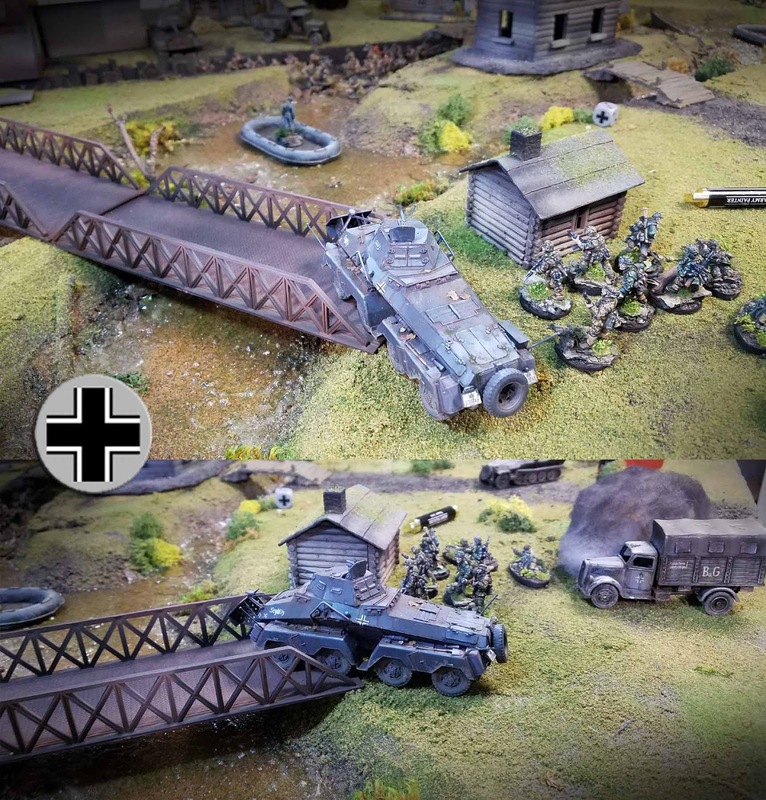 The Soviets attempted to destroy the transport half track with their small arms, but only managed to immobilize it. 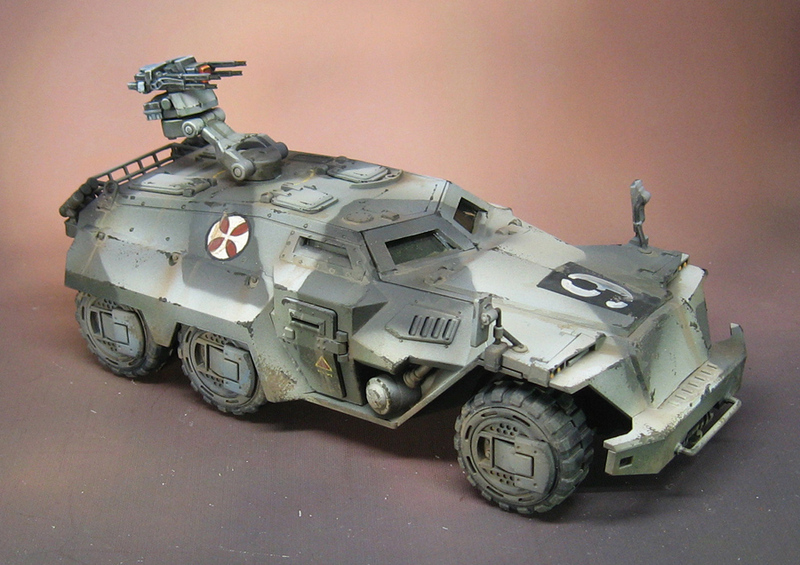 This would now act as a shield for the survivors of the Pioneer unit. 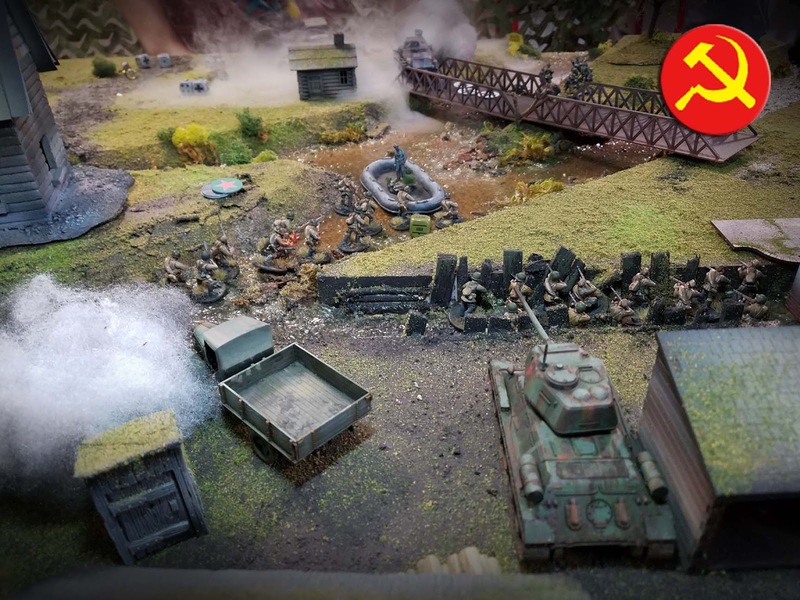 As the German officer was overwhelmed by the Red Hordes in the river, the time lost by the Waffen SS to the destruction of their transport proved too costly. They could not win the race to the wreck of the Panzer 2. 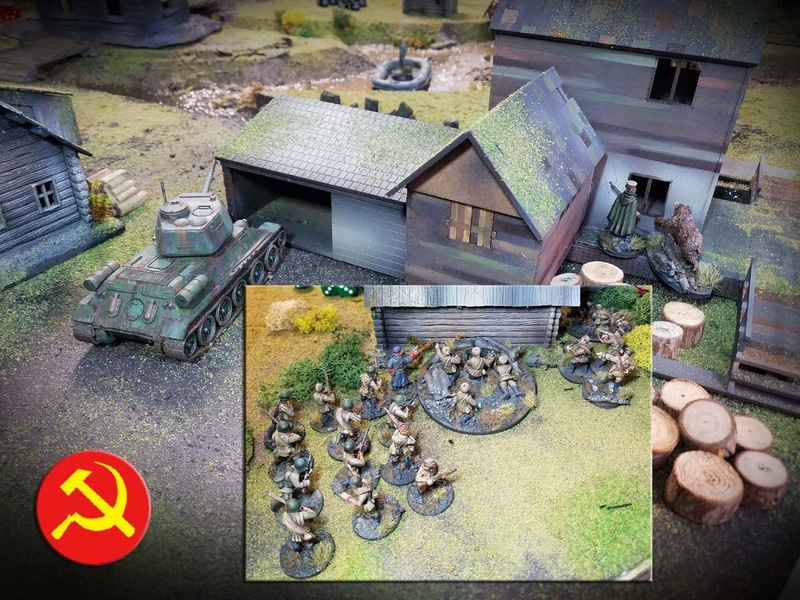 It was now that Comrade Royanovich took matters into his own hands, and attempted to steal away the objective at the last moment. His bravery managed to turn the contest into a draw, but did he ultimately survive? We shall see the next time these bitter enemies meet on the field of combat. 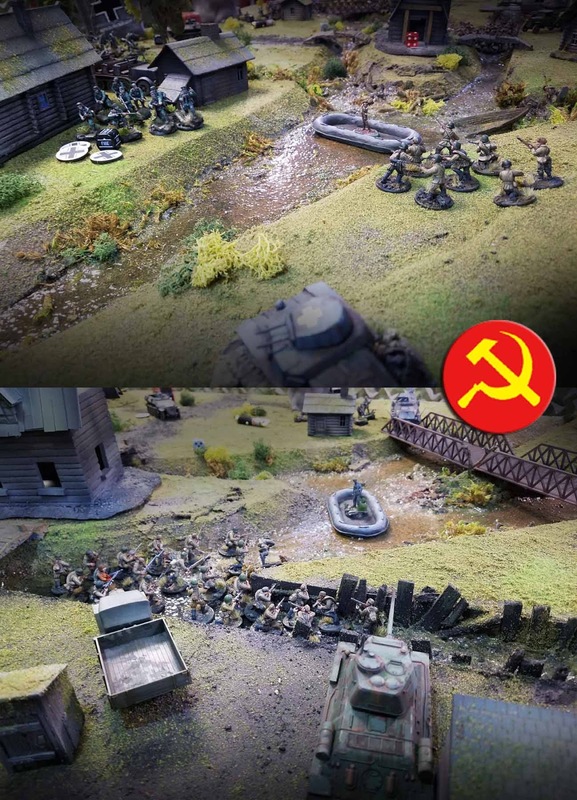 The battle will now shift to a different part of the Soviet Union. But the carnage certainly shall remain the same! 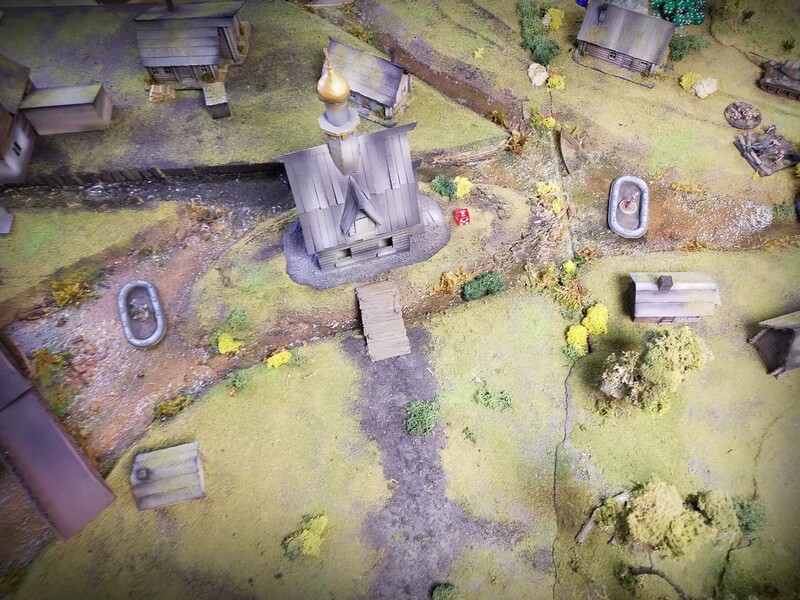 In the latest installment of our Barbarossa campaign, the fighting continues over the tiny village of the Island Church. However, the objective has changed entirely! No longer interested in the town itself (it has since been bypassed by the Wehrmacht armored columns! 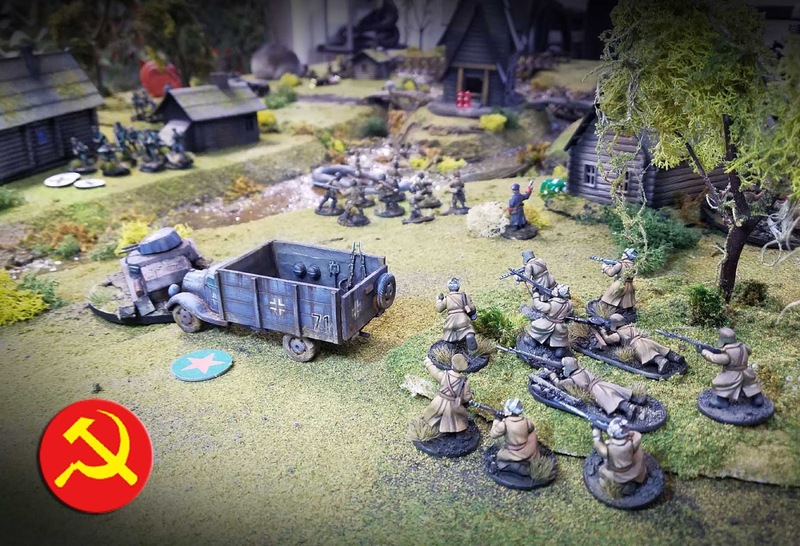 ), an elite force of German troops must try to capture a downed Soviet pilot. She is part of the Black Witches squadron, and she is known to be in the area. The Soviet forces are trying to rescue her before she is captured. This mission was deemed to be of such importance that a German officer and a recon unit of tanks was sent in to find her. Those vehicles had been knocked out by growing Partisan activity, and he finds himself stranded in enemy territory! 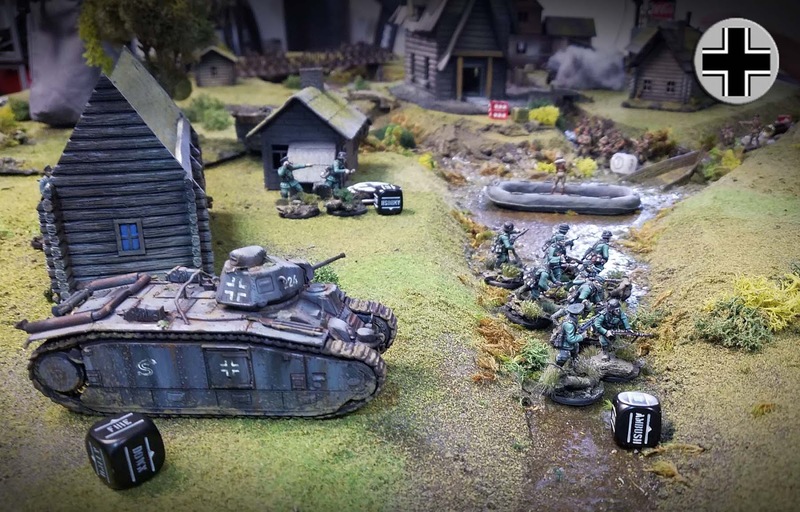 It is anticipated that this mission will be very difficult, so the hardiest of Waffen SS units will be tasked with recovering the stranded officer and capturing the enemy pilot. They are few in number, but it is thought that they could slip back into the town less noticeably than a larger force of regular army. Some new reinforcements have arrived in the town, among them Siberian veterans. 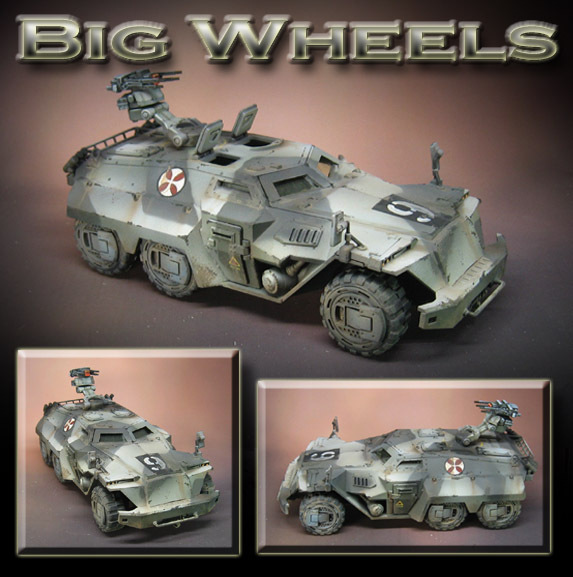 The wheeled vehicles would find it rough going, which meant that the deployment areas were even further restricted. 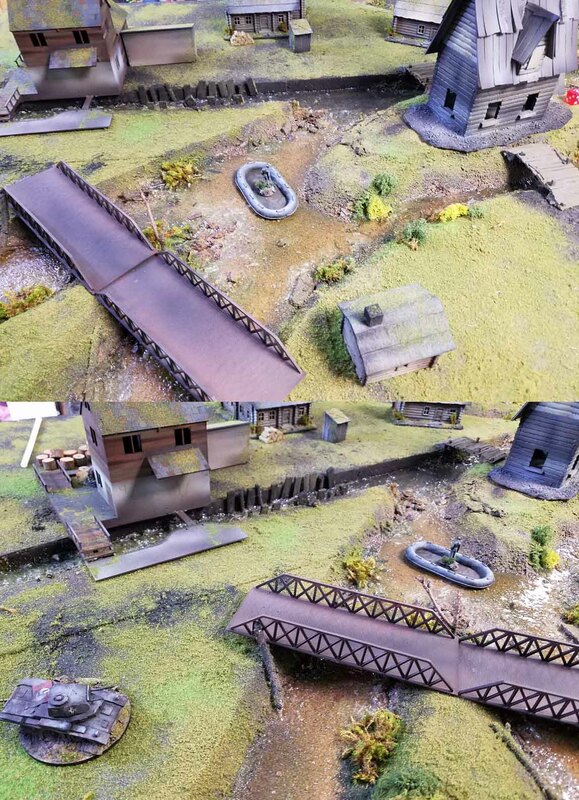 These Russian villages seem to be ideal for the defense, with each log cabin and shack presenting an excellent hiding place. 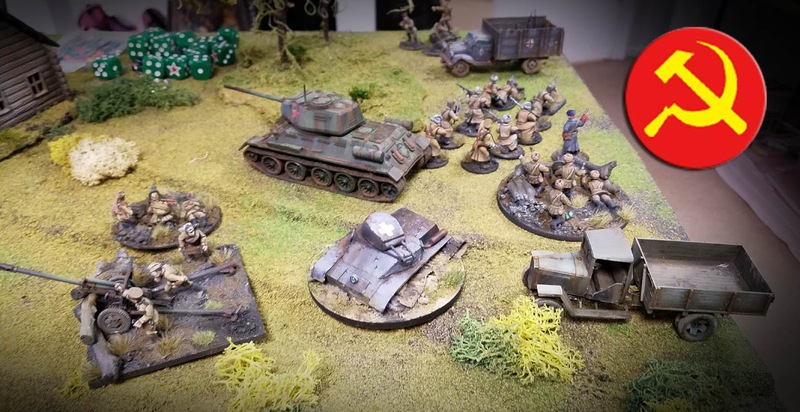 Somehow this small but determined group of German soliders must hold off these advancing hordes and rescue the surviving crews of the knocked out tanks! 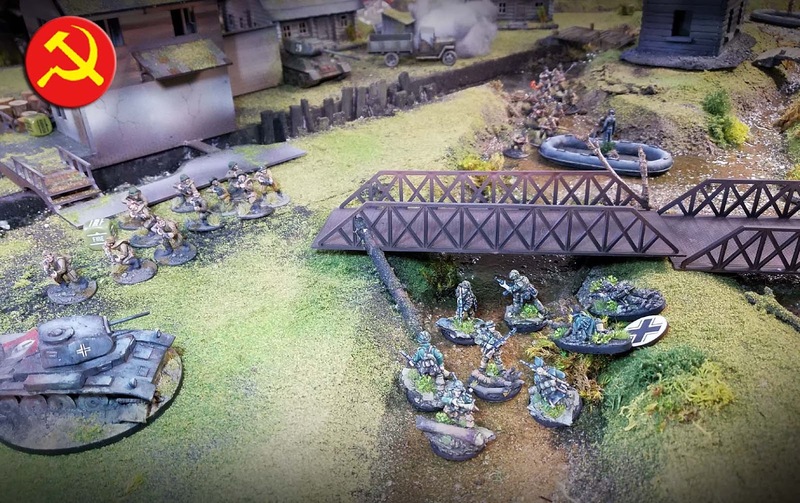 As usual, the Soviets slog through the gullys and streams to hide from the Axis firepower. One of the Black Witches is in view, attempting to paddle to safety in one of the discarded German rubber boats. 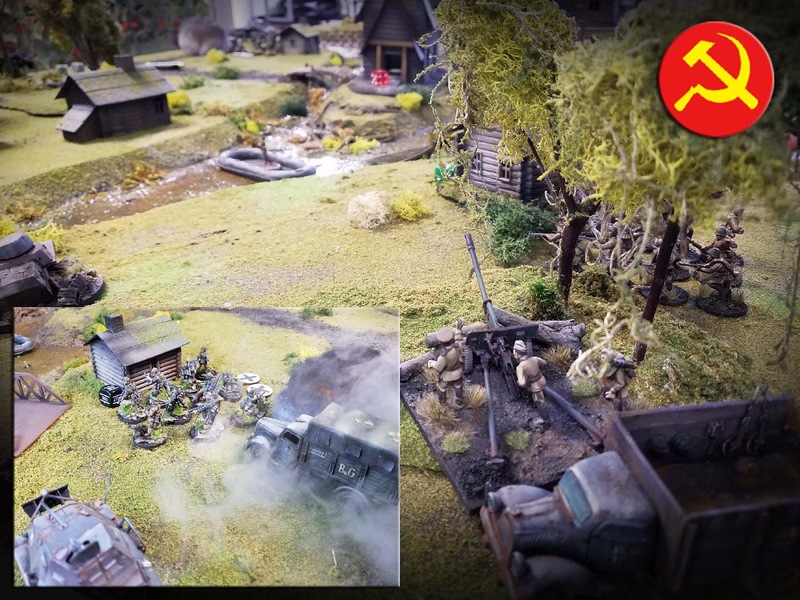 A Zis field gun has been brought in to cover the troops, and it claims a victim on its very first shot! 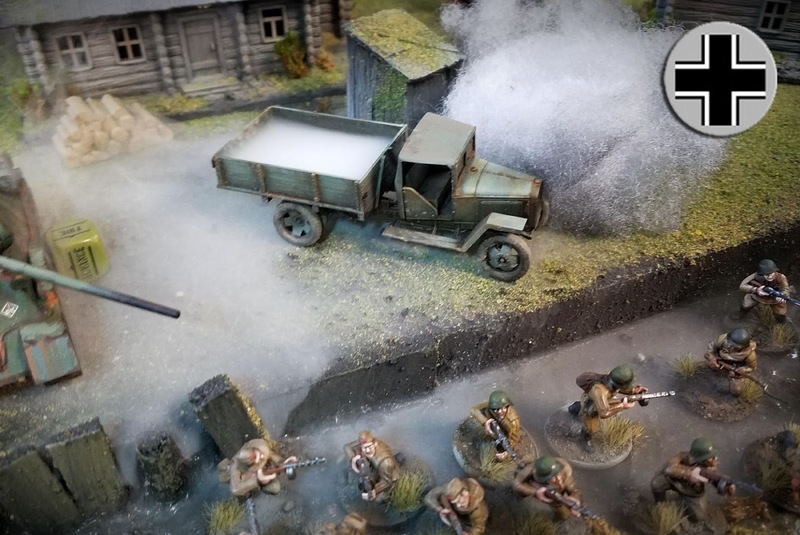 The Opel Blitz goes up in flames, and the Waffen SS passengers must bail out to avoid burning to death themselves. 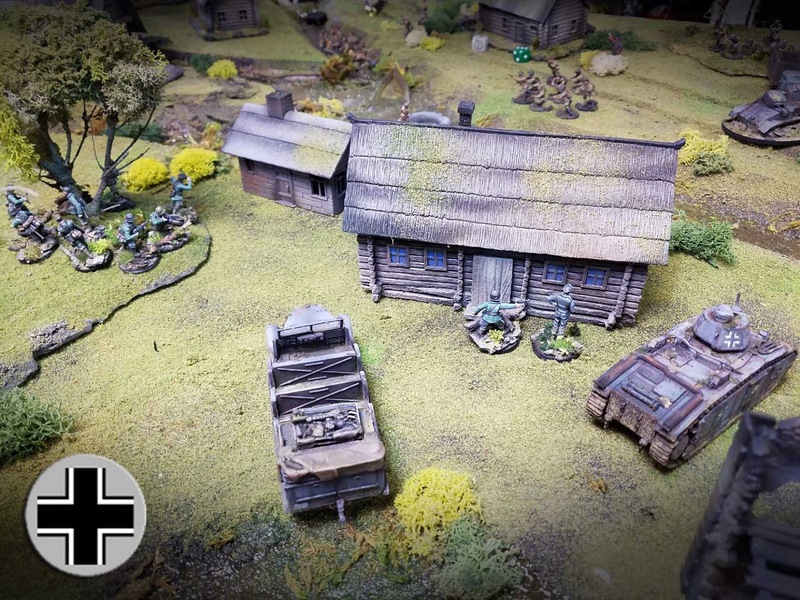 They attempt to take cover behind the tiny bridge house, but the deadly sniper Sletlana is waiting for them in the top floor of the lumber mill. 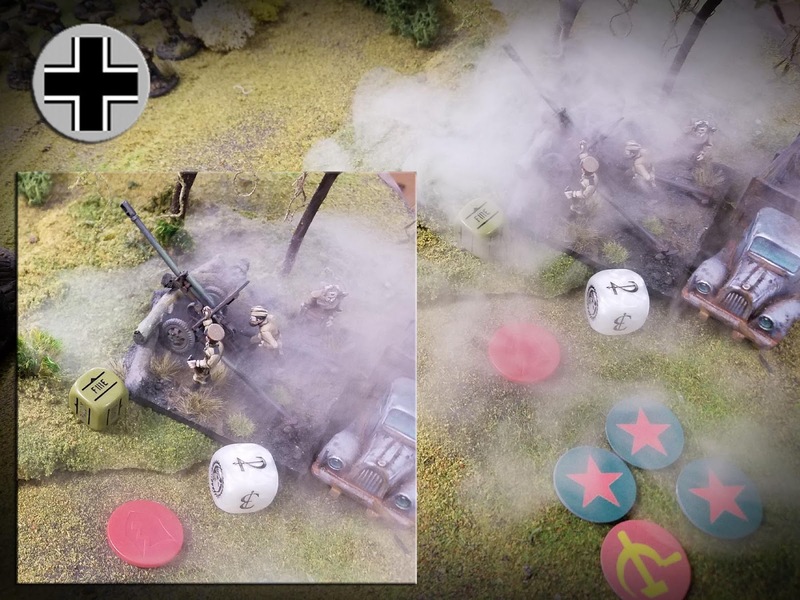 The flame and smoke unleashed by the Zis gun must have betrayed their position, making it easy for the mortar observer to direct a well placed shot into their midst. Even with Great Patriotic War, what remained of the crew chose to flee the field. 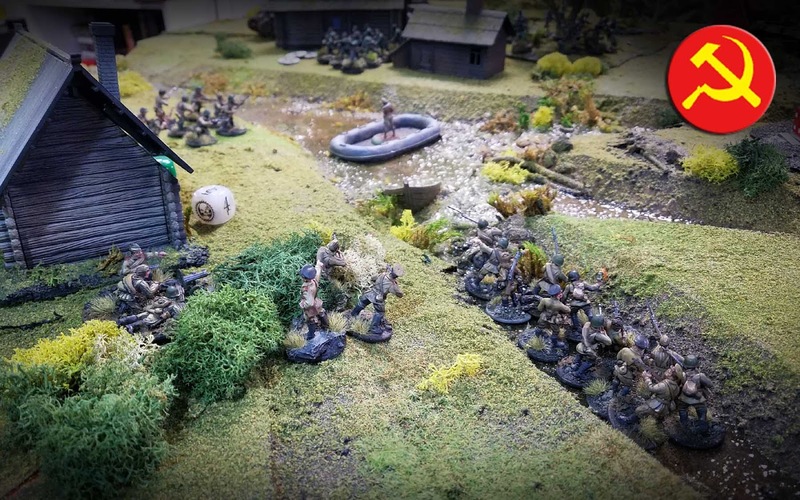 With the threat of the direct howitzer shot now gone, and the potential for the mortar to deal with the machine gun teams in the nearby building, the veteran Heer unit surged towards the river, and the Black Witch pilot. 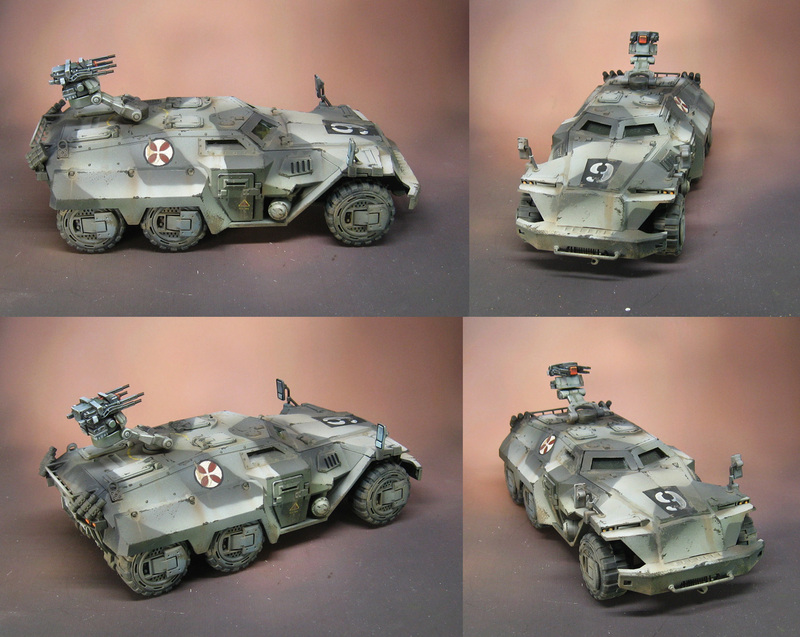 Perhaps this is why the shattered Zis crew chose to exit the stage... the rumbling of the Flammpanzer!!! As we have seen all to often on the Ostfront, the hapless 'free' squad of raw recruits is directed toward the enemy as cannon fodder. 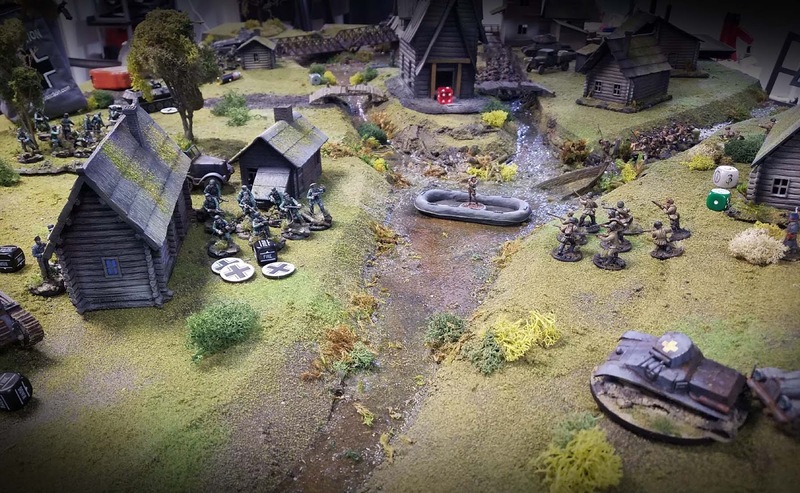 With the new Commissar Royanovich nearby, they had little choice but to move into the teeth of enemy fire. 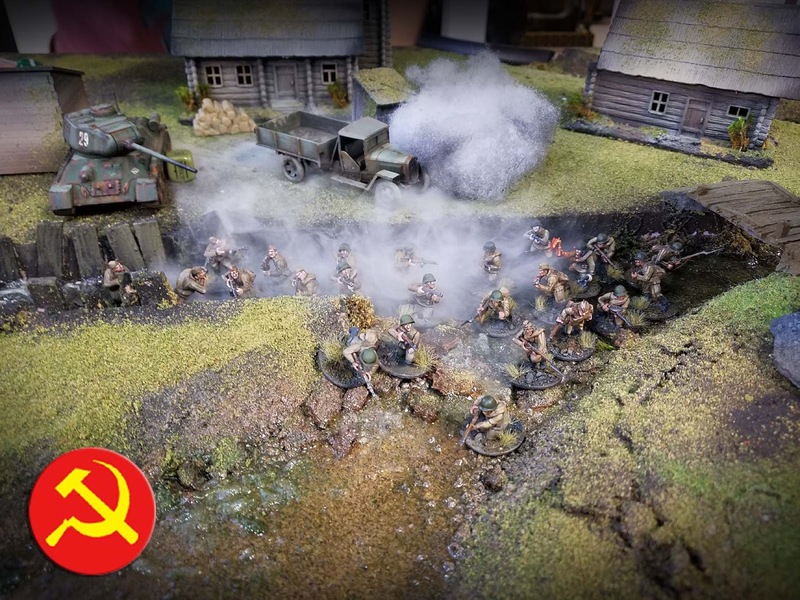 This covered the advance of the regular units of the Red Army, but on the right flank, they chose to hold their ground and let their own superior firepower deal with the scattered Waffen units. They were being whittled down by the sniper, who managed to take out both light machine guns. This would mean a nearly free hand for the Russians to clam the wreck and the captured officer. 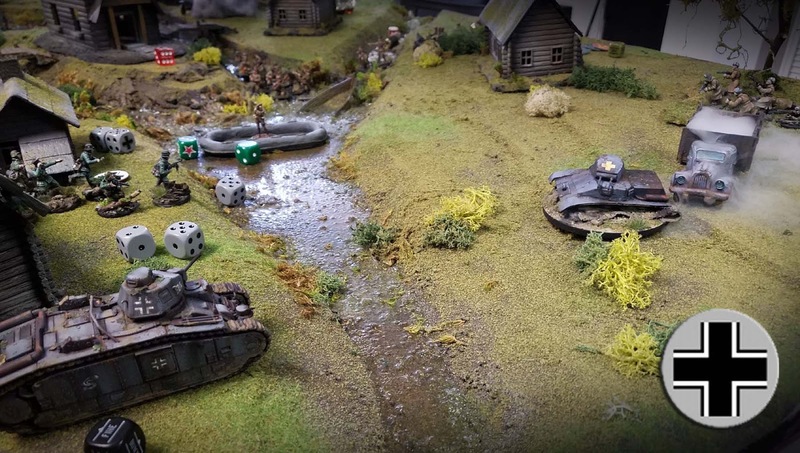 Seeing this threat, the Rad 8 chose to risk the hazard of the T-34 and fire its autocannon into the mass of Soviet troops hiding in the stream. Apparently the water makes for some great cover, and the shots nearly always missed. The Red Hordes close in on their primary objective... rescuing their heroic pilot. Will they bring her back to the aerodrome for more heroics, or can the elite of the Wehrmacht manage to fend off an army twice their number? Give that Dog a Bone!! 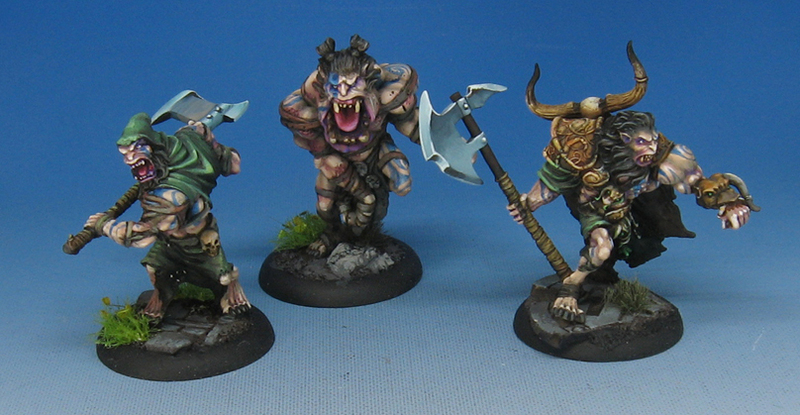 Here's another version of the Malifaux hell hounds. 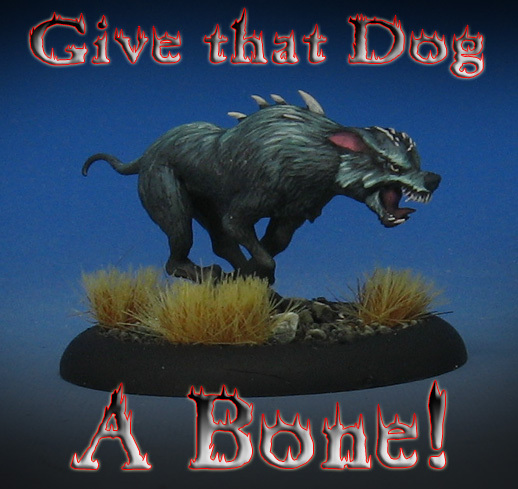 Just as I did with the first hound, I made a series of glazes to establish the darks and shadows. The fur texture on the figure was very fine, so I had to bring more of that out with actual brush strokes. I worked mostly with the Reaper Liner paints, which are fantastic in that they can be thinned down to a great degree, and yet keep their color integrity. They remain dark and heavily pigmented. By adding a light, opaque color to them, I was able to create some nice mid tone fur colors as well. I always enjoyed painting wolves in 2D, so I have fun whenever I get the chance to paint them in 3D! :-) When I did the original set of Painting Pyramid instructional videos, painting fur certainly had to be part of it!! 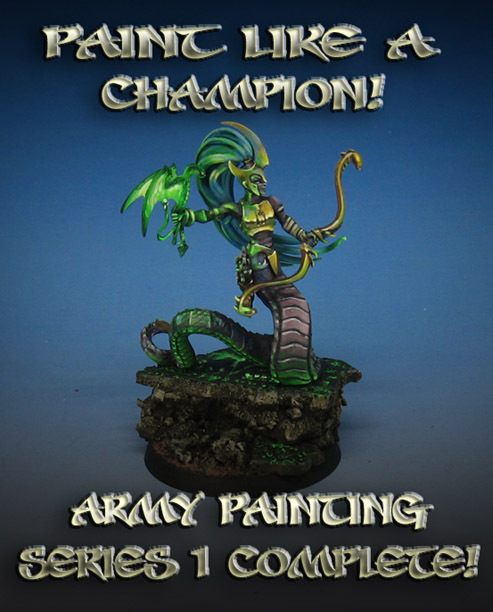 Paint Like a Champion! 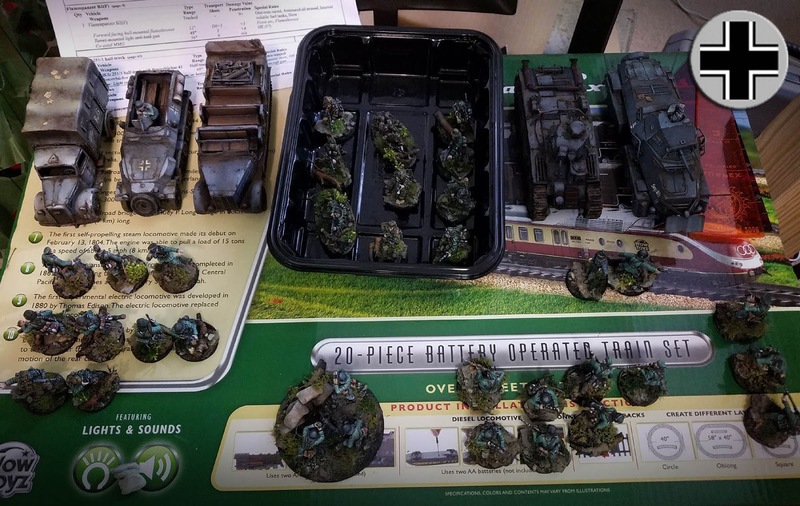 Army Painting Series 1 complete! 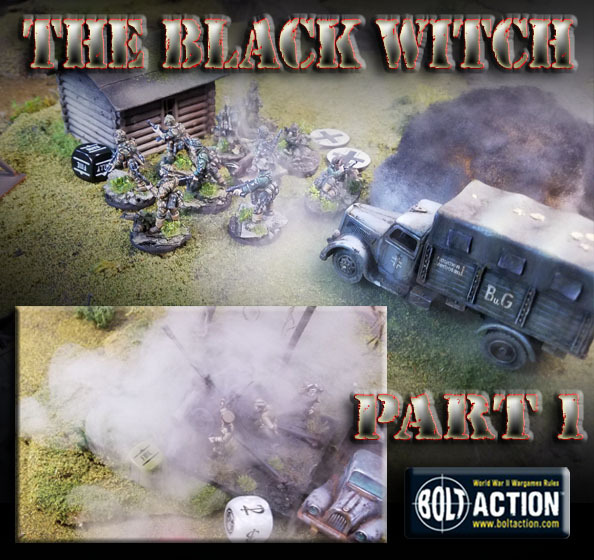 With Army Painting Series 2 about to be posted to the Patreon Page, it is time to check out some images of figures painted during the very first five episode unit painting guide. It all began, as it should, with an episode on Basing Techniques and how to approach a unit. I used the Dark Runes texture roller from Green Stuff World, and I went through the process of creating bases that would suit the "footprint" of the figures which would be painted. 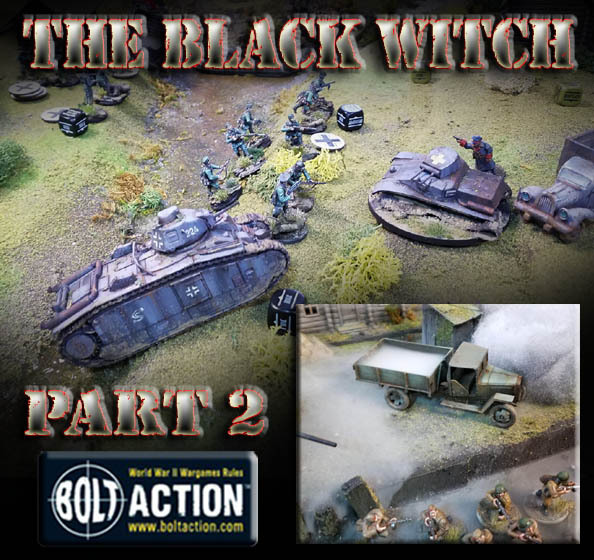 The second episode is an in depth guide on how to paint one of the figures as a "color test" figure, and how to use that step to make decisions for the rest of your unit/army. 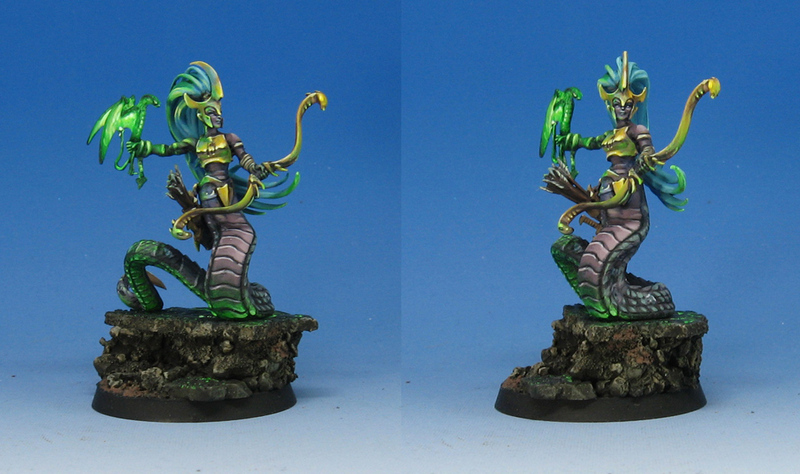 That is, how complex do you want the color scheme to be, and will it match your basing, etc. 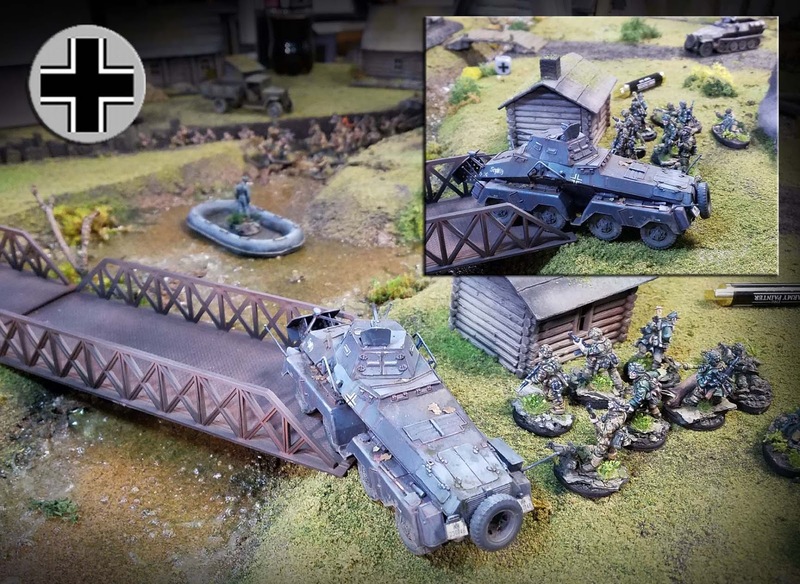 From there, I demonstrate how to do my normal painting techniques such as Shaded Basecoat and Glazing... but in a format which I have never filmed before! 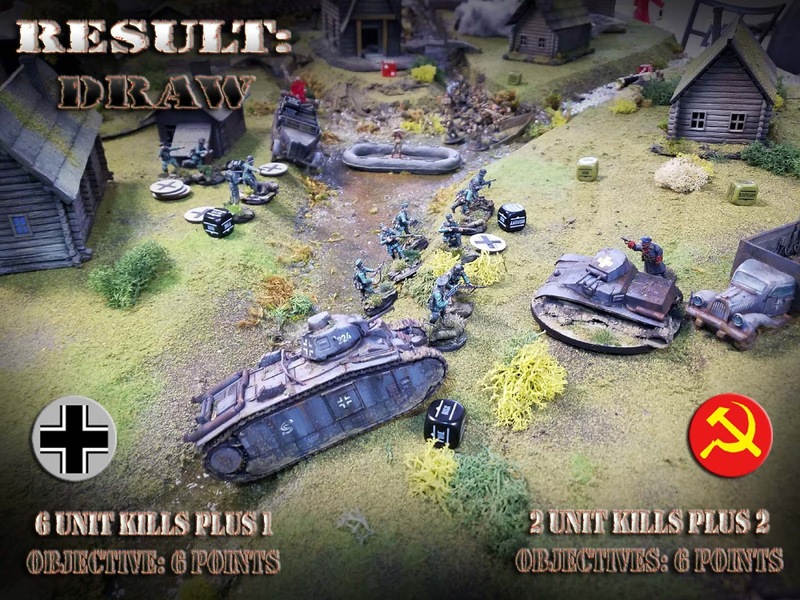 While I have a number of 'pictoral' step by step blog posts on unit painting, doing several figures at once live on camera was really interesting! I think that it might be the best way to show why I developed these approaches in the first place, since the still images really don't show the speed and simplification involved. As I am painting, I try to emphasize the thought process as much as possible, since knowing 'why' is actually more important than knowing 'how'. That is certainly how I felt all through my Art School days. 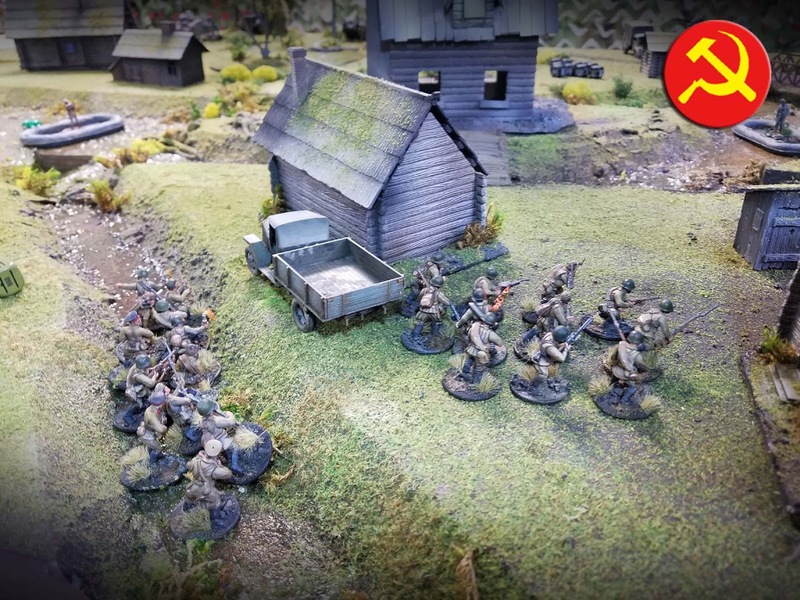 I will be posting the first episode of Series 2 later tonight, which will take you through a historical army, and using the Mig Ammo Oilbrushers. 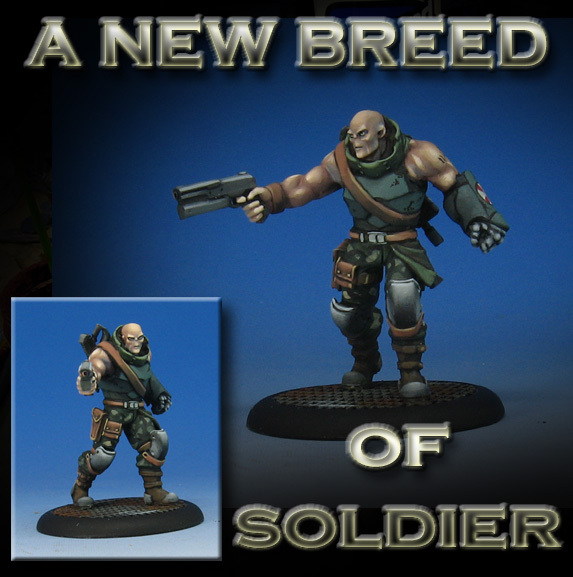 To view the Army Painter series, the basic pledge is $15. Should you want a "hard copy" high resolution version on a USB drive, I have that available for a $50 pledge. For those who are interested in having one or more of the miniatures painted in the series, I do have a pledge level for that at the $100 level. This rather large and complex kit was a learning experience with the airbrush, especially when it came to messing around with the air pressure and masking! 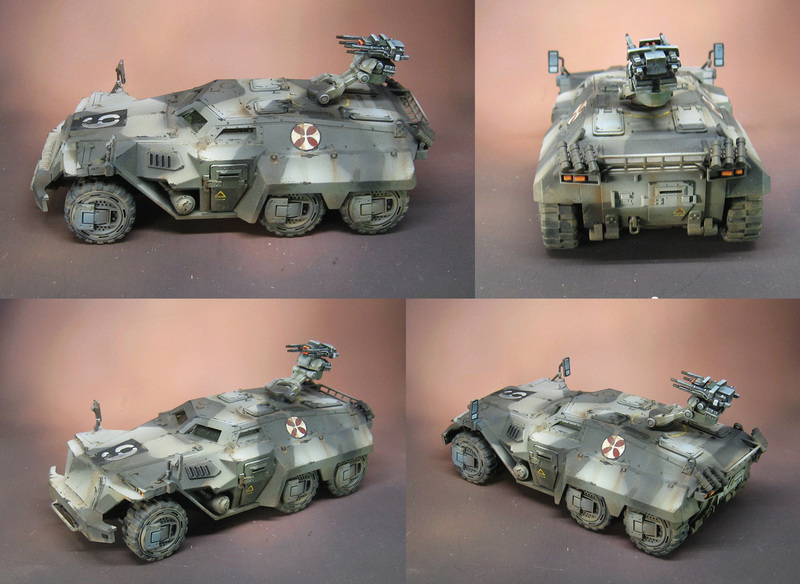 The request was for very subtle colors and weathering on this, so I had to pull back on what I would normally do. Other challenges involved moving parts, and even rubber tires! Back to the future with these Scale 75 miniatures. I am not sure if they still make this line or not, but they were interesting to work on! A very specific set of colors and marking was requested, meant to match another group of figures from other manufacturers. This is something that is very common when you do what I do! You constantly have to adjust your process to meet the challenge of matching colors to disparate miniature lines... matching basing, insignia, and so on.